Money is vital need today for everyone. Anything and everything is purchased by money except love. 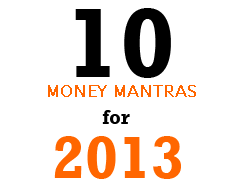 2013 is begin and we are herewith 10 Money mantras of 2013. Following these money mantras will help you in achieving financial freedom. Very simple and basic rule to follow this year is making more money or try to find out way to make more money. One can make more money by doing additional task (Working extra mile) or can make more money by doing work smartly. The important thing is to find the best way for you to make more money, and then to build your goals around this. For making more money you can use these simple money making ideas. Once you earn your money, you need to hold onto it. Protecting your money is another mantra this year. Many people earn money and make money but they are poor at protecting money. I am not talking about theft. I am talking about protecting your money from unwanted expense, taxes, brokerage and additional charges. Remember small charges that adds up to big money. If you are not budgeting your money these year you must start budgeting your money, Budgeting money will give idea about your spending habit and your limit. If you are facing budget crunch there are two ways to solve it decrease you’re spending or increase your income. Either will erase a budget deficit. In the long run, increasing income is a better solution. Extra money in your pocket should pull extra money or how surplus money you have is generating more money is called as leveraging your money. It is often thought of as doing more with less. If you put your money in a bank deposit, it is very safe but you don’t get a real lot out of that leverage decision. However, if you decided to invest same money in investment class which can give more return like equity or real estate, you have got more leverage out of your money. Financial information doesn’t just mean knowledge of basic financial concepts — it also means detailed knowledge of the investments you make. Warren Buffett is the most successful investor of all time, yet he never takes a gamble. He conducts extensive research before buying a company. Obtaining this information allows them to invest with confidence. This year you must try improving financial information about asset class where you invest your money. Knowledge is Power. Once you ‘know’, you can ‘do’. If you want to retire, start figuring out when. Say to yourself ‘I want to retire in __ years, I want to live a lifestyle of Rs. _________ per month’ and start working towards it! Remember to keep in mind inflation. If something costs Rs. 10,000 today, and we assume 8% inflation per year, then in 10 years it will cost Rs. 21,589. This means that simply to keep pace with inflation your money must earn 8% return, wherever it is invested. And if you want to do more than just keep pace, you must earn more than 8% per annum over the long term. The best way to figure out how much more you can save every month, is to look at your budgets of the past 6 months. But there might be a problem. Most of us don’t keep budgets. Here’s a little tip: look at your bank statements of the last 6 months – they won’t tell you everything but they will show you broadly what your spending habits have been like, and if you have been using your credit or debit card more than cash, then you will have a clearer picture. Use very simple categories – groceries, utilities bills, travel & conveyance, medical, house & vehicle maintenance, shopping, insurance premiums (includes life, non-life, vehicle and any other insurance you have, take the per annum premium and divide by 12), eating out & entertainment, and 1 or 2 other categories if you need them. You might find that you are spending more on medical expenses than you thought, or more on entertainment and eating out. The best way to save money is cut down on unnecessary expenses. Even if you save Rs. 3,000 per month and invest it, over 30 years you can earn Rs. 2.07 crores (assuming 15% return per year). The trick to making things easier is just to get organized once. Once is all it takes to get everything set up, and then you can sit back and relax. So, sit down right now, and make a list of the bills you are paying. From electricity to gas to family cell phone bills, you can have a combined list, and if you have the option of making it an online payment (direct debit), do so. You can still check your bills every month when you receive them, but you save yourself the hassle of remembering to write cheques, standing in queues, and having to take hours off work to do it. One should find out way to maximize tax saving in alignment with goals. It is imperative that you start with the tax planning activity right from the beginning of the financial year, rather than towards the end. The tax saved can be invested towards achievement of your crucial goals such as children education, their marriage, your retirement and your other financial goals. Let’s face it. If you want your car serviced, you’re going to go to a service center you trust. If you have a medical concern, you’ll go to the best doctor you can find. Self-service only works sometimes on matters which do not require expert opinion. But in certain matters where you need to obtain expert opinion; you must! You must hire a financial planner to plan your finances. The clarity, the benefits, and the feeling of control over your financial life will make you wonder why you never did this before! These 10 money mantras are short, easy and very, powerful. Don’t wait. Don’t think ‘I’ll do this tomorrow’, because postponement can disrupt the objective of putting your finances right. So you need to do it now – do it today! « Should you invest in Hudco tax free bonds?